On the occasion of our last conversation in the summer of 2002, Douglas informed me he was sending me some things from his lacrosse days. We had talked about our respective days playing lacrosse frequently and listening to his stories from the golden age of lacrosse was captivating. I received a package a couple weeks later from his wife, Essie, along with a letter informing me Douglas had passed away a week prior. I was heartbroken to read my friend was gone. Following through on his wishes, Essie had sent me the box he had prepared for me. To my estonishment, Douglass sent me several vintage lacrosse medals he had been awarded while at Friends School and Johns Hopkins. I was truly touched he would entrust me with something so personal. I proudly framed them and hung them above my desk and I look at them daily remembering of Douglas and his extraordinary life. Douglas Stone and his lacrosse medals inspired me to search for and collect other vintage lacrosse medals. 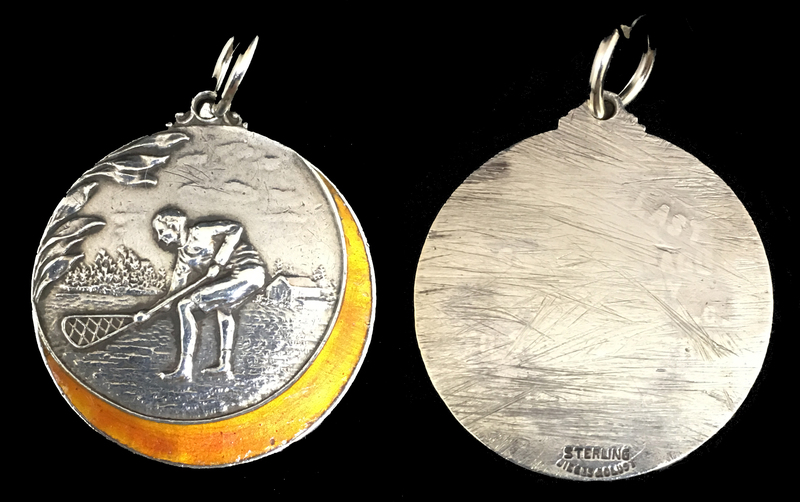 My collection led to my desire to create a new generation of lacrosse medals displaying the same beauty as the old medals. This mission eventually led to the establishment of my company, Laxmedals.com. I hope the story of Douglas Stone's life and his medals, and the others collected since, inspire you as they continue to inspire me. - Michael Rogers, November 2013. 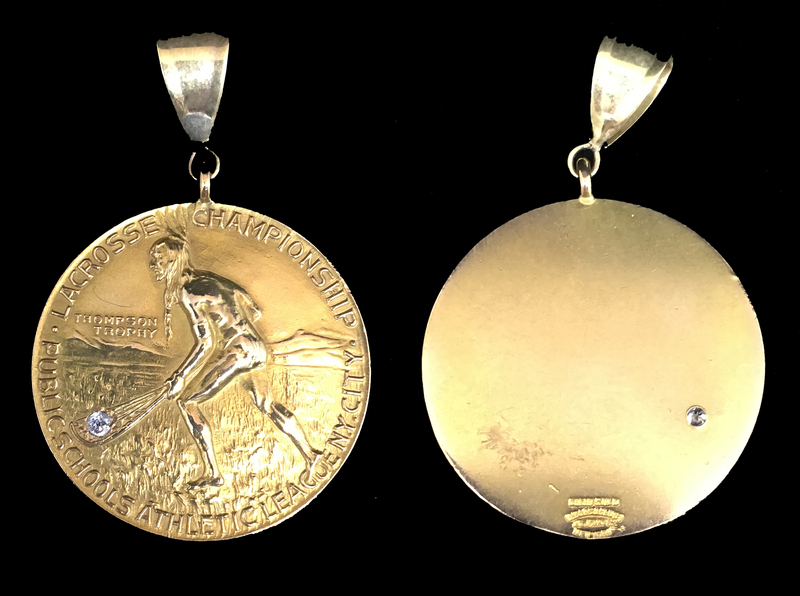 These five medals were presented to members of the four World Lacrosse Champions in 1986, 1990, 1994, and 1998. 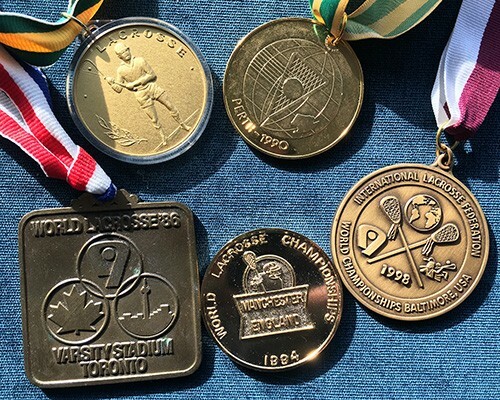 These medals were awarded to Nolan H. Rogers, the Team USA Lacrosse general manager during four World Lacrosse games starting in Canada in 1986, Australia 1990, England 1994, and the USA 1998. 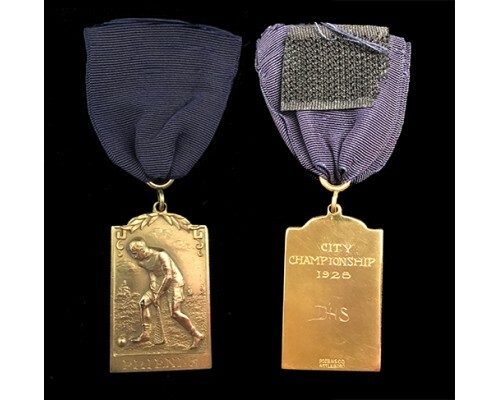 Presented to Douglas Stone in recognition of the 1928 Friend’s School Varsity Boy’s Lacrosse Baltimore City Athletic League championship. Born in Baltimore, Maryland on March 29, 1911, Douglas attended Johns Hopkins and was a member of the 1932 Hopkins Lacrosse team, which participated in the Olympic Games lacrosse exhibition in Los Angeles. 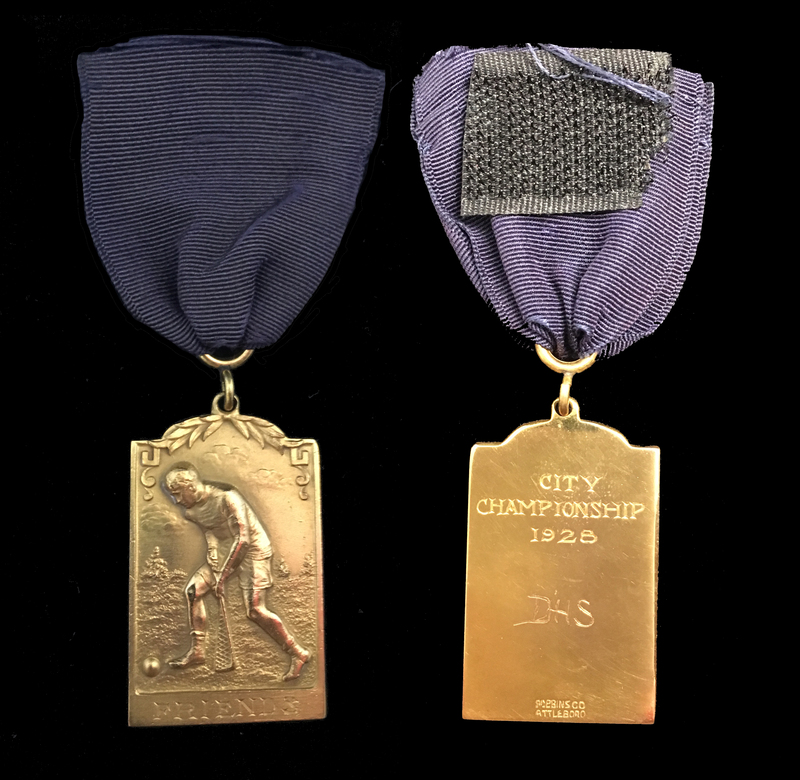 Reverse engraved "City Championship 1928" and then the initials "D.H.S." by his hand. Manufacturer was the Robbins Company, Attleboro, Mass. Color gold with blue drape ribbon. Measures 1.75 x 1 inches. Click on image for larger view. Below: Stone in 1944 U.S. Army Medical Corps. Douglas Stone is a remarkable member of the lacrosse community history. A member of the 1932 national champion team at Johns Hopkins, represented the United States at the 1932 Olympic Games in Los Angeles, and participated in the Allied invasion of Normandy, France performing surgery and saving lives on the invasion beaches on the evening of the D-Day invasoin. You can read more about Dr. Stone in the book Answering Their Country's Call: Marylands in the Second World War. This medal was presented to Douglas Stone in 1932 for his participation on the Johns Hopkins University Lacrosse team designation National Champions by the USILA. 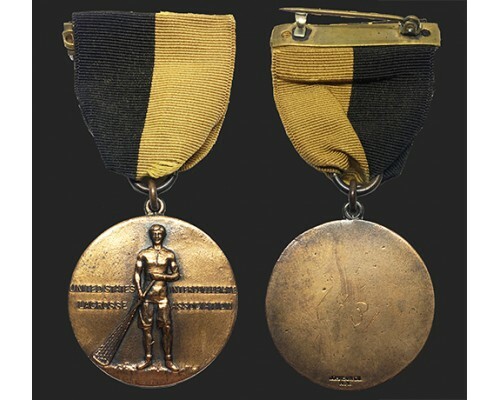 The team recorded a record of 11-0 and also won an Olympic trial tournament to represent the United States at the 1932 Olympic Games Lacrosse Exhibition in Los Angeles. The Blue Jays played Canada 3 games besting the Canada squad 2-1 (Photo at top of this page is the JHU team shown in action v. Canada). Color bronze with orange and black drape ribbon. Reverse etched with "1932" by Stone. Manufacturer Johnson Company, New York, NY. Measures 1.5 inches across. Unknown recipient. This medal was created to honor "Colonel" Robert Means Thompson. Thompson graduated from the Naval Academy in 1868 and Harvard Law School in 1874. Became president of the NY Athletic Club and US Olympic Committee and who argued for the establishment a lacrosse championship for NY City public school boys in 1910 as an alternative to football Thompson thought football was too violent a game for young boys and in his application to the Board of Superintendents of the Public Schools of Greater New York, Col. Thompson described the virtues of lacrosse as a “Purely American game…” and argued for the establishment of a championship series because lacrosse was a “…fascinating and graceful game requiring one to be fleet of foot, quick eye, good judgment in the passing of the ball, or what is known as team playing, and it has none of the physical dangers of football.” The only documentation of the championship occurring reports a championship was to be held in 1918. Manufacturer is Dieges & Clust of New York, the famed medal and trophy maker of the 20th Century. 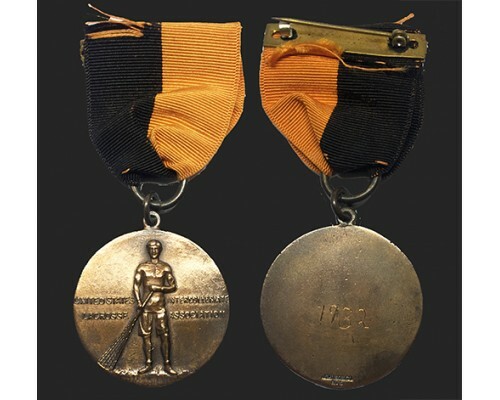 Marked “Solid Gold – NY” Measures 2 inches. Color gold with faux diamond insert. Click on image for larger view. Below: Colonel Robert M. Thompson on right. Presented to a J.M. Lane on Monday July 13, 1903. Presented to participants of the “Orange Lacrosse Demonstration” in the City of Pembrook, Ontario, Canada. Manufacturer unknown. Measures 1.5 inches. Color gold with red and black drape ribbon. 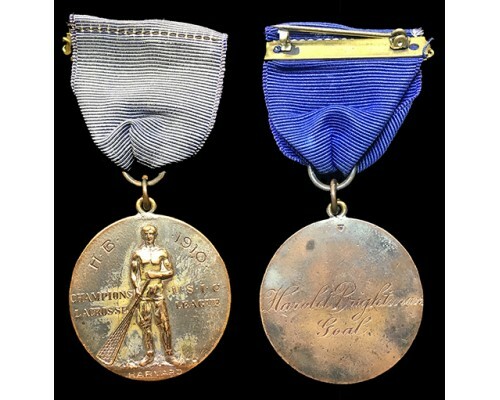 Reverse marked “10K.” One of the most decorative and beautiful lacrosse medals found. 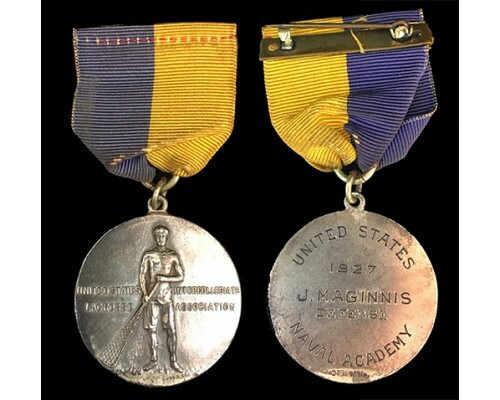 Unknown recipient, although it appears the initials "D.A.R" are engraved on the reverse center and may hint to the original owner of this medal. 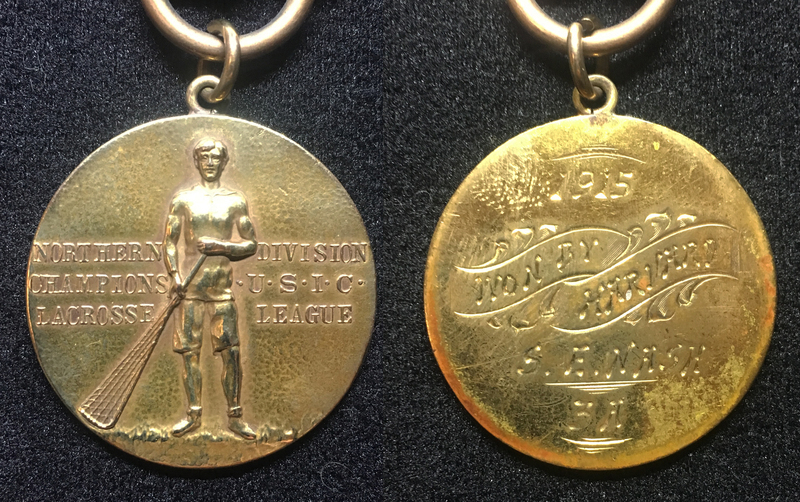 This medal was presented to a member of the Staten Island Athletic Club (engraved as SIAC on the medal reverse) following their victory over the Athletic Club of Schuylkill Navy (ACSN) by a score of 7-1. SIAC defeated the Manhattan Athletic Club (MAC) in the semi-final game 7-2. The championship was held on the morning of Saturday, October 11, on the grounds of the Columbia Athletic Club in Washington D.C. Manufactured by the John Frick Jewelry Company, New York, NY. Color gold with red drape ribbon. Measures 1.25 inches. 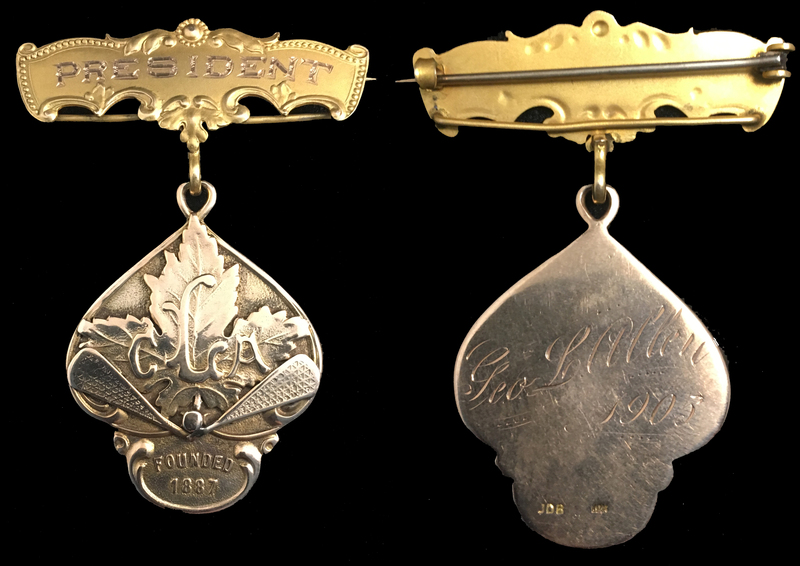 This medal was presented to George Allen, president of the Canadian Lacrosse Association in 1905. 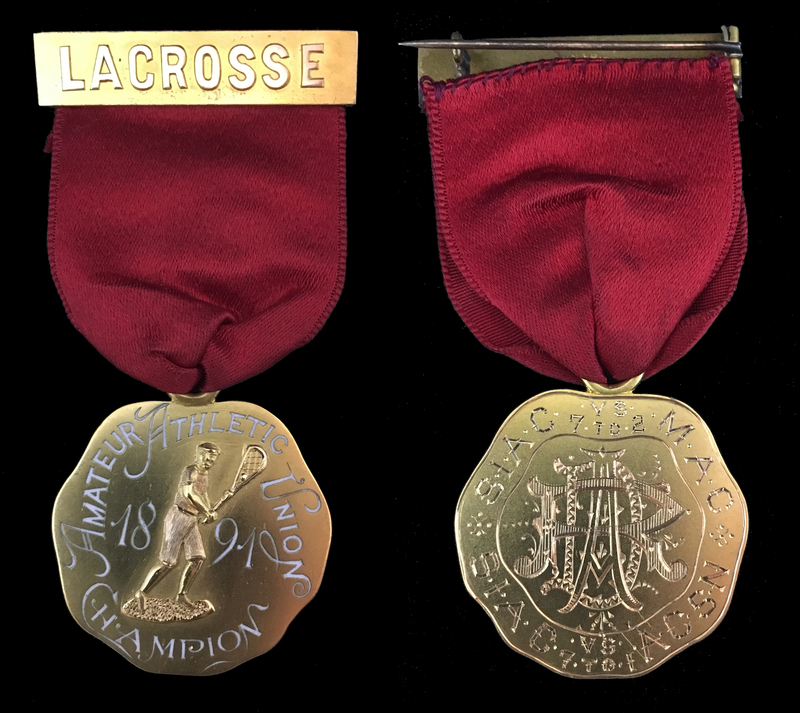 The medal has a beautiful maple leaf design with lacrosse sticks. 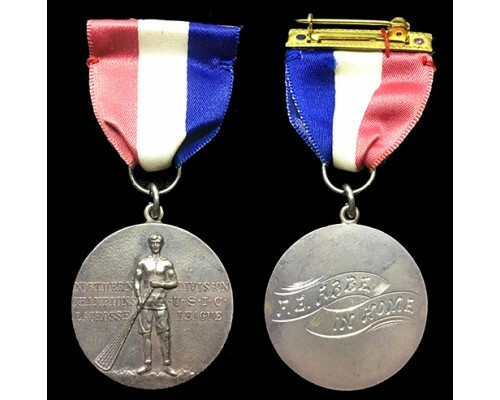 The medal measures 1.5 inches x 2 inches. Marked 10k gold and "JDB," an unknown jewelers mark. George Allen was born in Arthur, Wellington County, Ontario in 1858. He was a schoolteacher for four years before pursuing the establishment of a mercantile business. He served as the President of the Canadian Lacrosse Association in 1905. 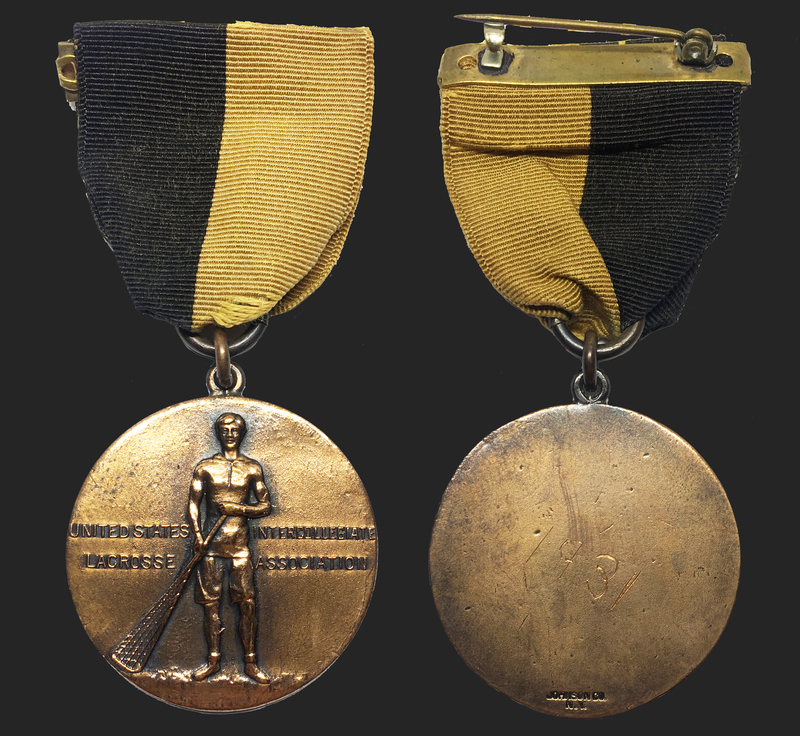 This history of this medal remains unknown, other than it was presented to a member of the "All Saints" team in 1903. 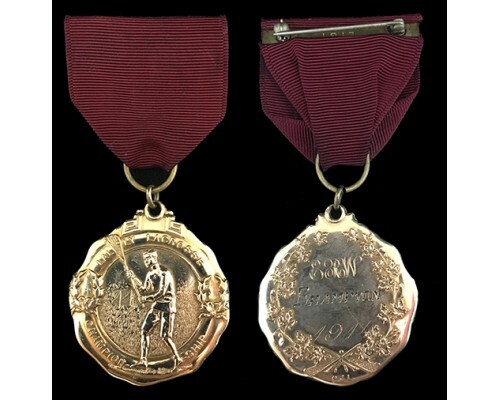 The medal was presented in recognition of a "Lacrosse Club Championship" the league noted as J.A.U.U. 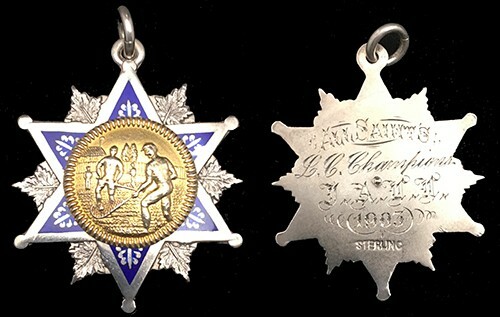 The medal has an elaborate maple leaf motif with a blue enamel inlay. 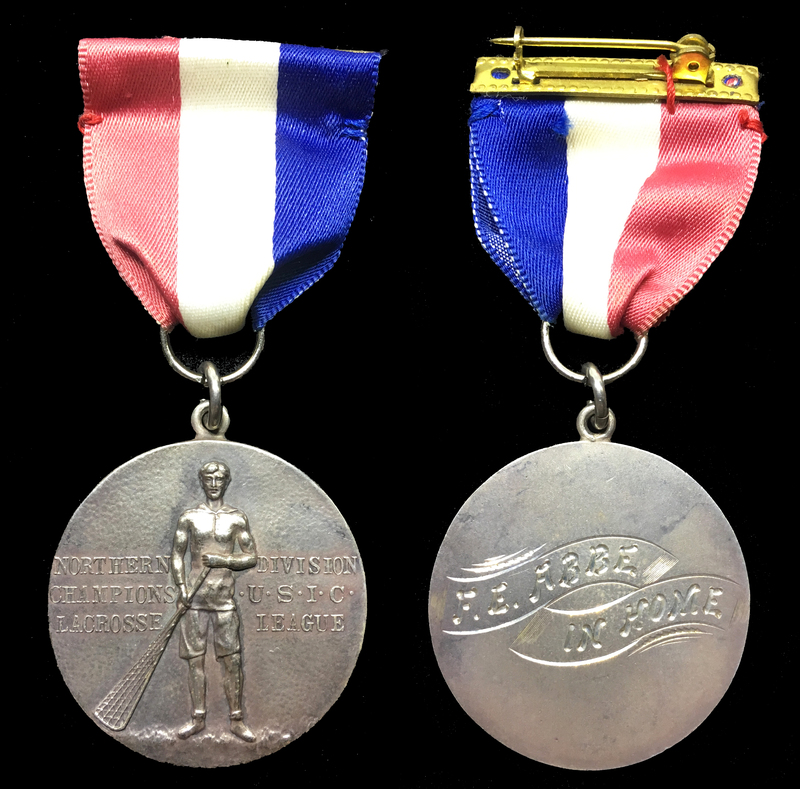 The medal measures approximately 1 inches in diameter and is marked sterling on reverse. No maker identification. 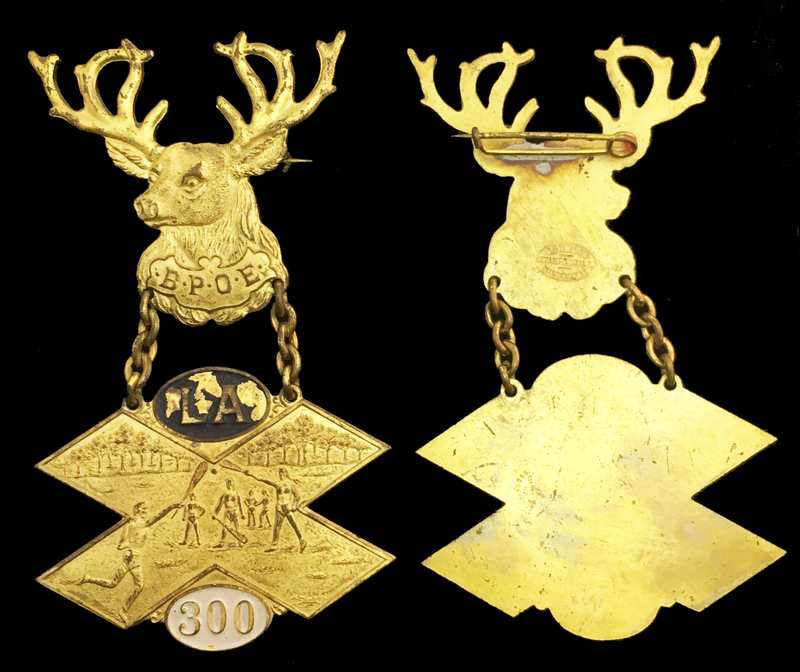 Created for the La Crosse, Wisconsin delegate committee for the fifth annual convention of the Benevolent Protective Order of the Elks (B.P.O.E) fraternal organization in Denver, Colorado 1906. According to the La Crosse, Wisconsin history records, the city's name was derived from "...the game with sticks that resembled a bishop’s crocier, or la crosse, in French, which was played by Native Americans in the vicinity.” The sport created by Native Americans we all now know as, Lacrosse. 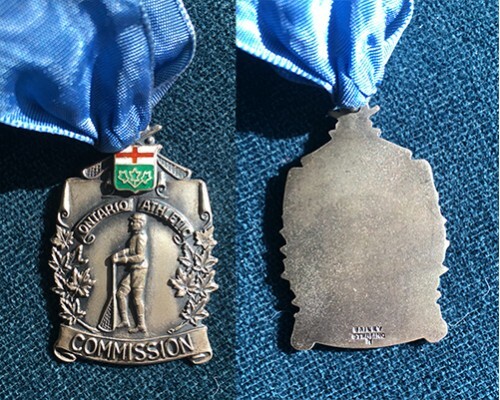 Reverse of medal is blank. Manufactured by the Scwaab Stamp & Seal Co. of Milwaukee, Wisconsin. The company was founded in 1881 and still exists in Milwaukee making rubber stamp and embossing tools. Color gold with enamel fill. Measures 4 x 2.5 inches. The 1977 Hobart lacrosse team captured the Division II National Championship, making it back-to-back championship seasons for Head Coach Jerry Schmidt and the Statesmen. It was the team’s fourth consecutive trip to the Division II title game. In the championship game on May 22, 1977, Hobart earned a 23-13 victory over Washington College. The Statesmen’s leading scorer, Roy McAdam ’80, established a tournament record with 21 points over four games. The 1977 Hobart team outscored its opponents with an astonishing mark of 351-112. Artist mark looks like a PAW copyright 1970, otherwise is unknown. Click in image for larger view. 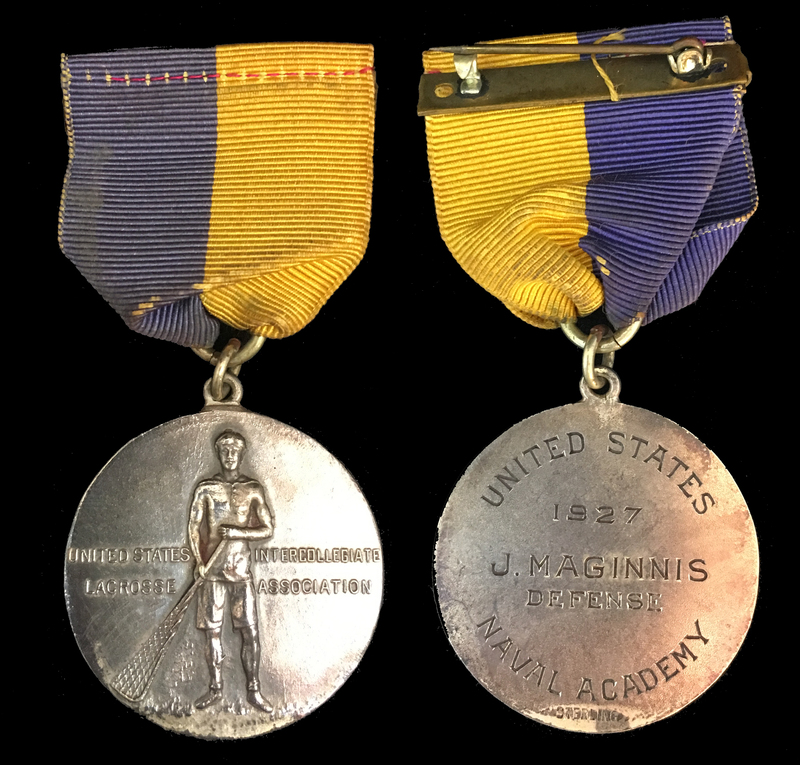 This medal was awarded to Jack Maginnis (USNA '27), defenseman on the 1926 United States Naval Academy lacrosse team. Maginnis was born in Duluth, MN. and was a three-time letterman on the football squad, but lettered only once in lacrosse his senior year. After graduation, Maginnis began a thirty-one-year career serving initially as a meteorologist aboard the Ship of State USS CONSTITUTION. His later assignments were aboard the destroyer USS PARROTT (DD-218), destroyer USS BLACK (DD-666), destroyer USS IRWIN (DD-794), and later commanded the heavy cruiser USS MINNEAPOLIS (CA-36) and heavy cruiser USS SALEM (CA-139). On July 8, 1953, Capt. Maginnis was aboard the destroyer USS Irwin when the ship was hit from shore batteries near Songjin, North Korea. A direct hit to the main-mast seriously wounded Maginnis. He returned to active duty in January 1954 and retired in 1957. Capt. Maginnis died in 1977. Medal color is silver with blue and gold drape ribbon. 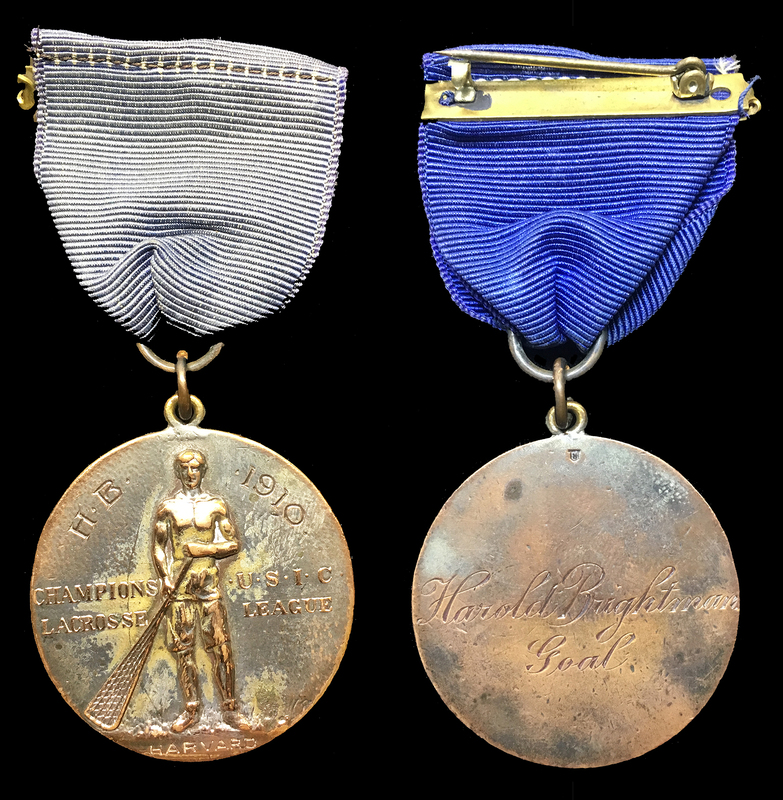 Manufacturer assumed to be Johnson Company, New York, NY., as later issues of this style medal bears its mark. Measures 1.5 inches. Stamped “Sterling.” Click on the image for larger view. Below: Maginnis receives the Purple Heart and Navy Legion of Merit medals in 1953. 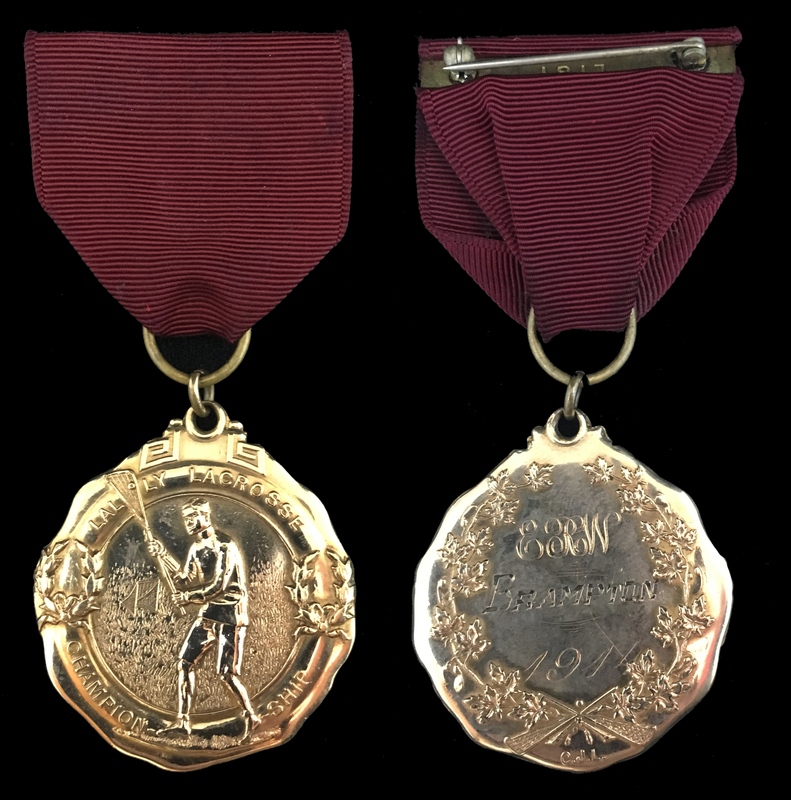 This medal was engraved for Harvard goalie, Harold Brightman, a junior and member of the 1910 Harvard University Men’s Lacrosse team. 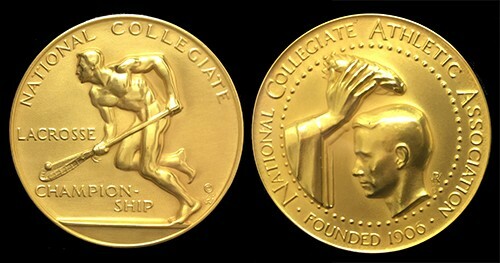 The medal was presented in recognition of Harvard’s northern division championship in the Intercollegiate Lacrosse league. The 1910 Harvard team finished with a 4-3 record with wins over Navy, Hobart, Columbia, and Cornell and loses to Johns Hopkins, Swarthmore, and Stevens. Southern division champions, Swarthmore, was crowned national champions. Brightman was born in Fall River, Mass. November 5, 1889. Following graduation he formed a career working for Filenes as a business manager residing in Boston, Mass. Color bronze with blue drape ribbon. 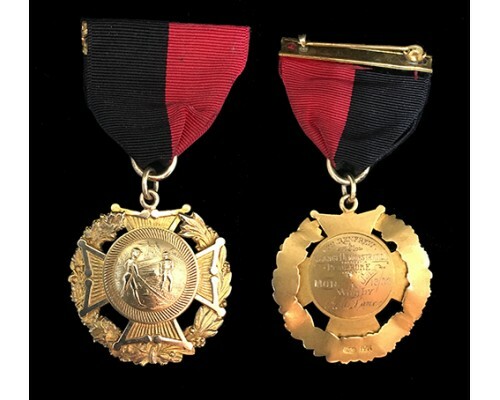 Manufacturer not marked, but I will assume the manufacturer was the Johnson Company, New York, NY., because later issues of this style medal bears its mark. Measures 1.5 inches across. 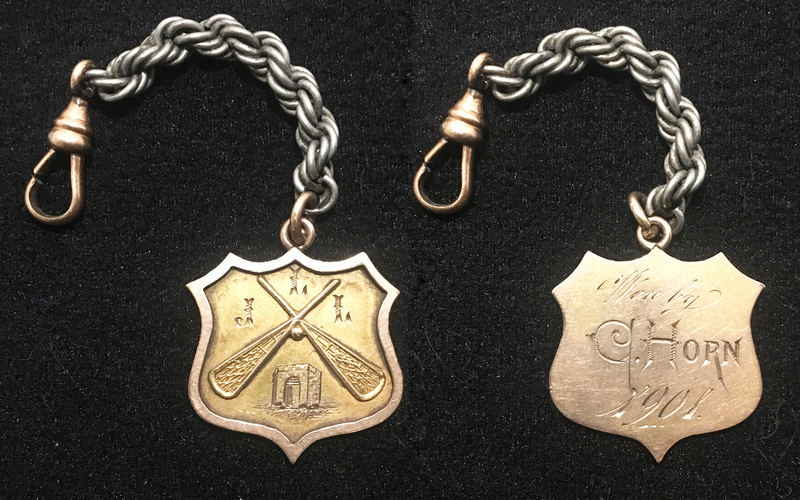 Presented to F. E. Abbe, of Fall River, Massachusetts, Harvard class of 1914. Undated, but was presented in either 1911, 1912, or 1913. Abbe was a member of the Harvard lacrosse teams during these years, which all won the Northern Division USIC championship. The medal would be a bit more special if received in 1912, the year Harvard was the sole National Champion. Harvard shared the championship title in 1913 with the Johns Hopkins team. Abbe is noted several times in the Crimson Times reports having a prolific shooting ability and being a leading force in the teams' success. After graduation from Harvard, Abbe enlisted in the Army Medical Corps on June 13, 1917 and served until discharged May 2, 1919. Measures 1.5 inches, sterling silver. Original ribbon missing replaced by the one shown. Click on photo for larger view. Below: The 1913 Harvard lacrosse team, Northern Division Champions. Many team members in this photo were on the Harvard 1912 National Champion squad. F.E. Abbe is shown in this photo but which one is unknown as the names of the players in this photo were not recorded. 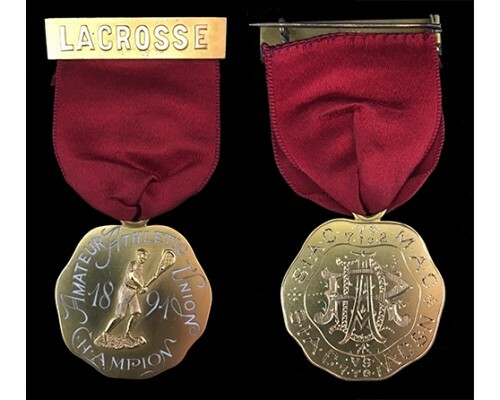 This lacrosse medal is of unkown origins. It measures 1.5 inches in diameter and marked sterling. Interestingly, it appears whatever engraving was on the back has been removed leaving only a faint outline of the engraving can still be seen. 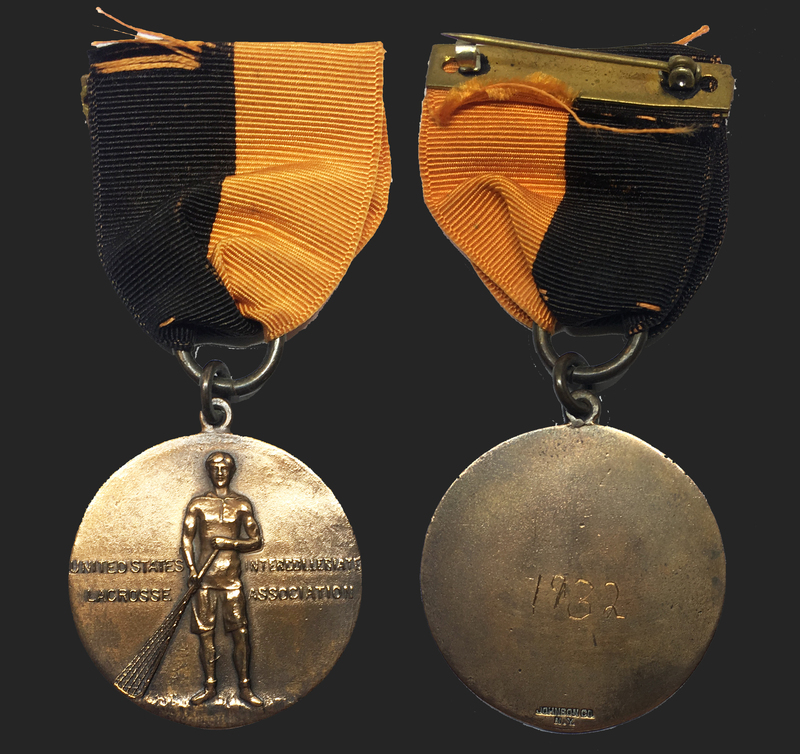 A very rare orange enamel inlay on front makes this medal very unique. Maker was Dieges & Clust, explaining the nice details of this medal. D&C were jewellers established in New York in 1898 by Col. Charles J. Dieges (b. Oct. 26, 1865-d. Sept. 14, 1953) and Prosper Clust. 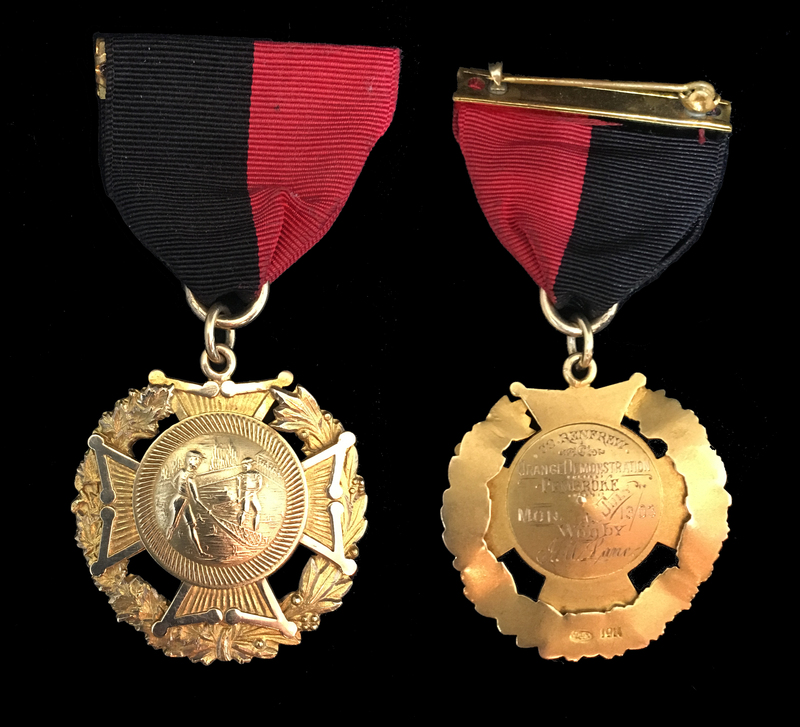 They produced many medals, including the Spanish–American War Medal, the 1904 Olympic Medal, the Eagle Scout medal (from 1916–1920), the Medal of Honour, and the Titanic-Carpathia Medals (at the request of "The Unsinkable" Mrs. Molly Brown). They made baseball's first Most Valuable Player Awards and many Baseball Press Pins as well as Lou Gehrig's farewell plaque. They also cast the Heisman Trophy. Perhaps the height of Dieges & Clust's production were the 1920s trophies known in sports collecting circles as "The Five Figural Spalding Baseball Trophies". The various trophies depict a baseball player pitching, catching, batting, playing first base, or playing in the outfield. The proportions of the figures and the details are remarkable. 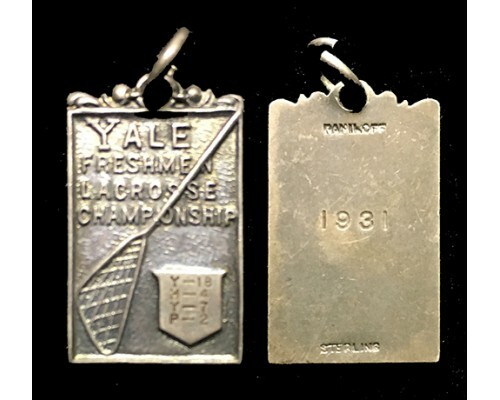 Awarded to a member of the Yale class of '31 Freshman Lacrosse team. The Freshman Elis lacrosse team defeated Harvard 18-4, on a rainy May 20th, and then Princeton 7-2 on May 26 to win the coveted “Big Three” Ivy League freshman lacrosse championship. 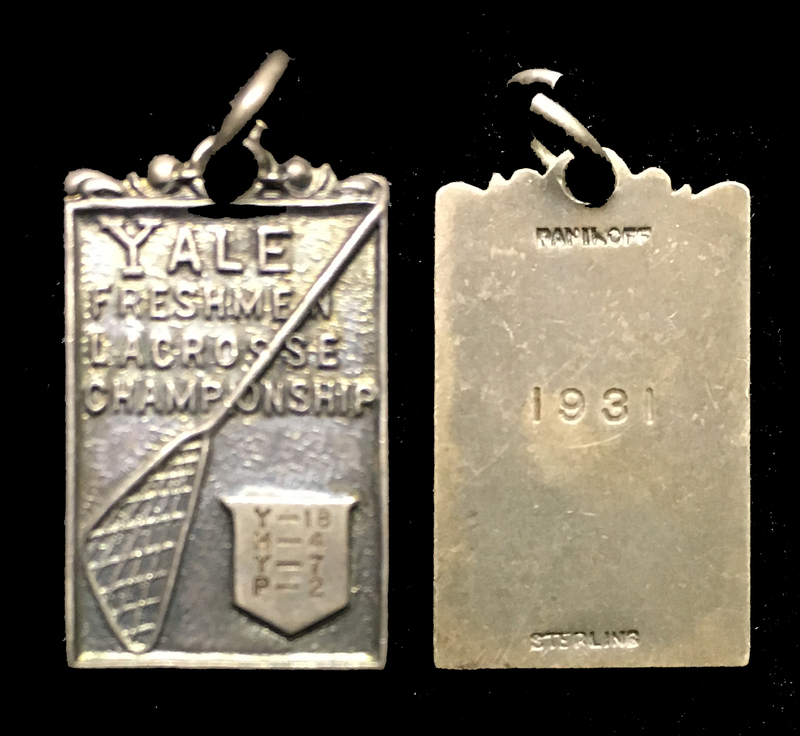 The specific Yale player who received this medal is unknown but it is possible one of two future First Team All-Americans, Earl Stevens or Winthrop Smith. Winthrop "Pinky" Smith was a star center on the Yale Lacrosse team for three years and was selected First Team All-American in 1930 and 1931. Smith was elected to the National Lacrosse Hall of Fame in 1968. The remainder of the roster included Draper, Rust, Fields, Scott, Dryfoos, Mallory, Fouck, Woodhill, Gaston, and Burrall. Manufacturer unknown although it appears there is a stamp “Rankoff” at the top on the reverse. Measures .5 inch x 1 inch. Silver marked “Sterling.” Click on image for larger view. Below: Winthrop "Pinky" Smith was a star center on the Yale Lacrosse Team for three years and was selected First Team All-American in 1930 and 1931. Presented to a “C. Horn” in 1901 for an unknown lacrosse participation. The front features an arch and the letters "J L L" both of which cannot be identified although I will guess the last two letters represent the words "Lacrosse" and "League." Color gold. Measures 1.5 inches with a 3 inch braided rope and clasp. Manufacturer unknown. Click on image for larger view. 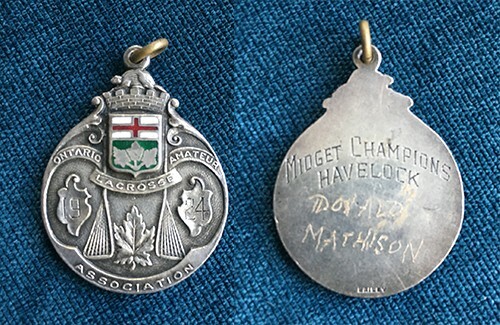 Presented to a Donald Mathison (name is scratched into the reverse), a member of the 1924 Havelock Midgets, champions of the 1924 Ontario Amateur Lacrosse Association tournament. Founded in 1913, The Ontario Amateur Lacrosse Association was the governing body for the sport of lacrosse in the Province of Ontario. Manufacturer is marked “Bailey.” Sterling Silver. Measures 1.5 inches. A medal presented by the Ontario Lacrosse Athletic Commission for some kind of lacrosse participation. Manufacturer mark is "Bailey" sterling silver. Measures 1 inch x 1.25 inches.